I just critiqued a novel where Gornick’s concept seemed particularly relevant. On the whole it’s an amazing novel, but I had a clear sense towards the end of where it went off the track, and why. It was because the writer lost track of the “story,” and just wrote “situation.” Without the “story,” the situation became merely material. Even though the material at that point was dramatic and even riveting, it lacked the real power that comes from the writer carrying through with the story under the situation. It can be a little confusing because Gornick’s not using “story” here in the traditional narrative sense. The way I understand Gornick’s “story” is that it is like an interior narrative, the internal journey that the protagonist is experiencing or undertaking which the external action–the situation–the plot– dramatizes and plays out. This journey is psychological, emotional, spiritual or all three. It is what the reader is actually tracking, even as his or her attention is captured by the external situation and action. It’s what gives shape and meaning to the situation. In a poem called “In the Waiting Room” Elizabeth Bishop describes herself at the age of seven, during the First World War, sitting in a dentist’s office, turning the pages of National Geographic, listening to the muted cries of pain her timid aunt utters from within. That’s the situation. The story is a child’s first experience of isolation: her own, her aunt’s, and that of the world. Sometimes the writer just knows what the story is, deep inside. It is just there, a given. Maybe the writer has processed the material deeply over time, either consciously or unconsciously. It’s available, without the writer having to grapple with it; the writer has integrated situation and story internally and it is fused already in the writing. Other times the writer only comes to the story through the process of writing the material. Gradually more and more comes together as the writer discovers what the piece is truly about. The most successful works of literature are ones where the situation and story are both functioning in concert with each other. We need both. In my client’s novel, in addition to what happened in the plot of the novel, I was tracking his “story.” To me the question that permeated the novel was “Would the protagonist live or die?” I don’t mean in a literal sense, though that did have some bearing. I meant would he be okay? Would he find a way to go forward in life, after a shattering tragedy? I was deeply invested in this question, and when the writer stopped carrying that thread through, the novel went off the track. He put in a chapter that contained the character and situation, but had no “story.” It didn’t continue to develop and advance the internal question that I had been following. I wasn’t even aware that that was what I was following until I got to a chapter that dropped the ball. But I suddenly felt how the material went slack, stopped functioning, even though there was plenty of surface tension. The writer had lost touch with what the book was really about. He had lost touch with what was at stake. He had dropped his story. In the novel I just reviewed, Brooklyn, by Colm Tóibín, the situation is the young woman, Eilis Lacey, leaving Ireland to have a better life in America, and her resulting experiences and choices (you can read a longer synopsis in my post about the novel). But the story is one of identity and self-definition. Who is she and who will she become? How will her experiences shape her and how will her choices define and change her? While we’re interested in and engaged by her experiences, what we’re really following underneath the surface events (whether we recognize it or not; doesn’t matter) is what will happen to Eilis? Not just will she live in Ireland or Brooklyn but what will that choice mean and how will it shape the rest of her life? Who will she be, what will her life be and what will her feelings about that life be? Everything in novel drives towards posing and answering those questions and once they are answered, the novel is finished. Tóibín has selected and shaped the material with that story ever in mind. It is always ticking below the surface, below the situation. We accumulate and track it because we read, after all, not just to know what happens, but to know what it means. 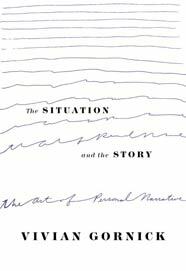 For the writer the point is that without story, as Gornick uses it, the situation becomes simply material. Unshaped, unfunctioning, unsatisfying. Every writer has experienced that joyful feeling when the writing is “on,” when things are working, when the voice is right, when what to put in and what to leave out is clear. Those moments are what keep us writing. Those are the times when the story and the situation are working together. Wow, yes, Paulette! Because I came to fiction from playwriting, I had the benefit of the great British theater and opera director, Jonathan Miller's thoughts in his book, SUBSEQUENT PERFORMANCES. Speaking about adaptation of fiction to stage or screen, he pointed out that the subject of fiction is always the thoughts of the narrator. The thoughts of the narrator! It's a thought journey even more than it is a plot. That's really interesting, Marisha. Do you (he) mean the narrator, as opposed to the protagonist? Hmmm. In a third person narrative, like Brooklyn, does that hold true? And in first person? Is it the thoughts of the character or the author? Too many questions! But I do get that idea about the "subject" of fiction, and how it isn't merely plot, the what happens, but what the author is really concerned about…i.e., the story. Unless I'm botching this! Yes, separate the narrator from the protagonist, by all means! And then separate the narrator also from the author. The narrator is a persona assumed by the author, as the best way to tell the story. Even in first person, the 'story' comes from the depth of thought about the past 'situation' recollected in tranquility. So it's not just the relating of the plot, but the selection of detail and the emphasis that conveys the thoughts of the narrator about what he or she is relating. I'm so grateful to Jonathan Miller for making the simple statement that the subject of fiction is the thoughts of the narrator because, viewed this way, story lifts off of situation, like a clear layer floating above it, in which the thoughts fluctuate, churn and clarify. And these thoughts are not always stated directly, but are implied in what the narrator choses to show us, and in voice and tone. But it's that layer which makes the piece of fiction worth reading. Marisha, thank you so much for clarifying this idea so articulately and helpfully! That's so brilliant about the 'story" being the thoughts of the narrator conveyed through selection and emphasis after the experience, in what is chosen and voice and tone. And it IS that layer that makes the fiction (and memoir) worth reading. Miller's statement may be simple, but you have made it clear to me. I'm going to be more aware of this "thoughts" concept as I read now! An amusing note about Vivian Gornick. I was at the MacDowell Colony a million years ago, when she was in residence, too. She caught me and the Minnesota composer, Kim Sherman, tuning in to The Prairie Home Companion, and scolded us. She thought Garrison Keillor was just awful, making fun of country people in Minnesota, in his Lake Wobegone monologs. She got the situation but somehow missed the story. That's priceless, Marisha. A perfect situation/story anecdote. Isn't Vivian Gornick/Garrison Keillor sort of a human oxymoron? Love this post and the commentary. It is SO illuminating to look at this slippery little book—having written about it, surely you know what I mean; it is dealing with subtle points and is perforce subtle and abstract—that is a touchstone in nonfiction from the POV of fiction. Having just read Ford's CANADA, I can say it's a perfect illustration. The narrator is the son of two rather ordinary people who become bank robbers, derailing his life as collateral damage. He tells the story as a sixtyish man, though what happens in the vast bulk of the book happened when he was 15 or so. We know this and it adds greatly to the story aspect, the narrator's brief deeper perceptions and withholdings, and to how vivid Ford can make the situation the teen is experiencing. Now, a difference is that were it memoir, instead of just presented kind of like one, I am sure the memoirist narrator would have a lot of foreground story about his subsequent life and his pain at losing so much, including being separated from his twin sister, who runs away. Such background as forestory would have been kind of boring but it's what we memoirists are inclined to do. Instead, we learn little biographical bits, like that he became a teacher and stayed in Canada where he was farmed out when his parents were imprisoned. A very short two-chapter final act is all that's in present time time qua the situation or the story. The narrator's story suffuses the novel, and we wonder about some mysteries that are answered in the final act. Fascinating and deft. I cannot recommend CANADA too highly! It shows how little can be needed of "now" story, the musings from the writer's present, though of course the foreground situation is full of the boy's story and some of the man's "now." See, just using these terms and trying to explain them and it can become weird. Paulette– Interesting! I think I finally understand the difference between situation and story (though I've thought that at least once before). So, thank you for the clarification. When work shopping the memoir I'm now working (or not working) on, I've gotten some feedback from classmates that has stymied me, i.e., but what is this about? Perhaps I need to write out the situation (again) and figure out the story (again). I always think that's what I'm doing when I write… figuring out what this means… but sometimes it's just not clear to the reader(s). I like writing for a teacher whose work I admire rather than a classroom full of peers, all of whom might respond differently. I think this is a downfall of the whole work shopping process. Anyway, thanks again, for your interpretation of situation and story. At least for today, I think I get it!